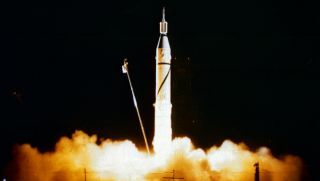 NASA videos commemorating the agency's 60th anniversary highlight accomplishments including the launch of Explorer 1 in 1958 and the subsequent discovery of the Van Allen radiation belts. Sixty years ago, NASA was established to push the boundaries in aeronautics and in space. And what a few decades it has been. The agency's accomplishments include visiting every planet in the solar system, putting humans on the moon and helping to build the massive International Space Station. How It All Began: NASA's roots came from a space race between the United States and the Soviet Union to show who had technological supremacy. After the Soviet Union sent the first satellite, Sputnik, aloft on Oct. 4, 1957, the United States faltered with its first satellite launch attempt on Dec. 6 – Vanguard TV3, which exploded. NASA switched rockets and the Jet Propulsion Laboratory's Explorer 1 successfully launched on Jan. 31, 1958. The spacecraft discovered the Van Allen belts of radiation surrounding the Earth. Just six months after Explorer 1, NASA was created to consolidate civilian space activity across the United States. What's Out There: One of NASA's major goals is to explore the universe in search of the unknown, including trying to figure out if there's life out there. In the last couple of decades, the agency's Galileo probe and NASA-European Space Agency Cassini spacecraft explored several icy moons of Jupiter and Saturn; there, microbes might be living in the ice. Meanwhile, NASA's Hubble Space Telescope helped nail down the age of the universe (13.8 billion years) by measuring how quickly galaxies are receding from Earth. Around 2021, NASA plans to launch the successor James Webb Space Telescope to zoom in on the universe's early history and to study the atmospheres of exoplanets. The Leading Edge of Flight: NASA's aeronautics research dates back to even before the agency's formation in 1958. The principle predecessor civilian aeronautics-focused branch of the government was the National Advisory Committee for Aeronautics, which researched early supersonic airplanes and other aircraft technologies. One of NASA's big innovations in flight was the X-15, the first aircraft that flew in space and landed on a runway — even before the space shuttle's first launch in 1981. Today, NASA is engaged in learning about hypersonic aircraft that could cross the United States in just 2 hours. The agency is also using drones to perform missions that are too dangerous for humans, such as examining damaged bridges after an earthquake. Trailblazing Technology: NASA's human moon missions of the 1960s and 1970s, during the Apollo program, revolutionized electronics because the spacecraft carried integrated circuits to the moon. NASA can do even more with the forthcoming Orion spacecraft; where the Apollo computer could manage just 85,000 instructions a second, Orion can handle 1.5 billion. Other innovative NASA technology includes the "sky crane" that landed the Curiosity rover on Mars in 2012, better filtration systems to improve water quality and satellite data that improves emergency officials' response after natural disasters. Home Sweet Home While NASA is known for launching spacecraft across the solar system, it also has been busy closer to home; the agency has launched more than 115 Earth-observing satellites in the last 60 years. These satellites constantly measure the changing Earth, especially climate change in the polar regions, since the balance of water and ice at the North and South poles drastically affects water levels and climate in the rest of the world. Satellites also feed back data about natural disasters, such as hurricanes or forest fires, to assist policymakers with their decisions to manage emergencies. Humans in Space: And of course, there's NASA's most iconic activity: sending humans to space. Over its six decades in action, the agency has selected and trained more than 300 astronauts. Human launches began with Alan Shepard's flight in 1961 and continued through the early Mercury tests and into the era of the Apollo moon landings and the International Space Station's years-long tenure orbiting Earth. Then, the video jumps ahead to Mars, NASA's first grand ambition for its next 60 years. You can read more about NASA's 60th anniversary at this agency website.